Cuts and scrapes. Bumps and bruises. Bites and Stings. There are a whole host conditions that come with end of summer activities. While not necessarily life threatening, if left untreated they can put a damper on any good time. The contents of a conventional first aid kit are fairly well known. Bandaids, gauze, tape, that sticky brown stuff that always seems to get everywhere. Less well known are our more natural first aid allies, the herbs. When used correctly, plant medicine can be super effective in working with those bumps in the road that seem to come with any proper adventure! And fortunately for us, there are a number of super common weeds that grow both here on the Front Range and throughout the US, that make up an ever present summer first aid kit. This is one that grows just about everywhere, from plains to way, way up there in the alpine zone (though perhaps a bit more hesitantly than it does in the lowlands). It likes a good bit of sun, but I've seen it growing happily in the dappled shade of a Ponderosa Pine forest. Contrary to what its lush, fern-like foliage might imply, it also prefers more nutrient poor and rather cruddy soil (cruddy being the technical soil science term for the stuff that many other plants prefer not to grow in). It’s all in the name. Achillea is a nod to Achilles of Greek mythological fame, who was said to have used yarrow to heal the wounds of his warriors. This is a potent herb for scrapes and cuts. Used fresh or dried, yarrow not only can slow bleeding but is what’s known in herbal parlance as a vulnerary-an herb that promotes wound healing. I will generally keep a few tea bags of dried yarrow in my herbal first aid kit to wet and pack on shallow cuts and wounds. There are a number of species in the US, many of which can be used in about the same way. Two of the most prevalent species are narrow leaf plantain (Plantago lanceolata), pictured above, and broad leaf plantain (Plantago major). Another vulnerary herb, plantain is especially handy for relieving the painful itch that comes with the bites and stings of small insects. The fresh herb, mashed and applied topically (known as a poultice) can be especially effective. I will also keep this as a dried herb in my first aid kit, but it’s such a common weed that you can usually find it fresh during the stinging insect season. 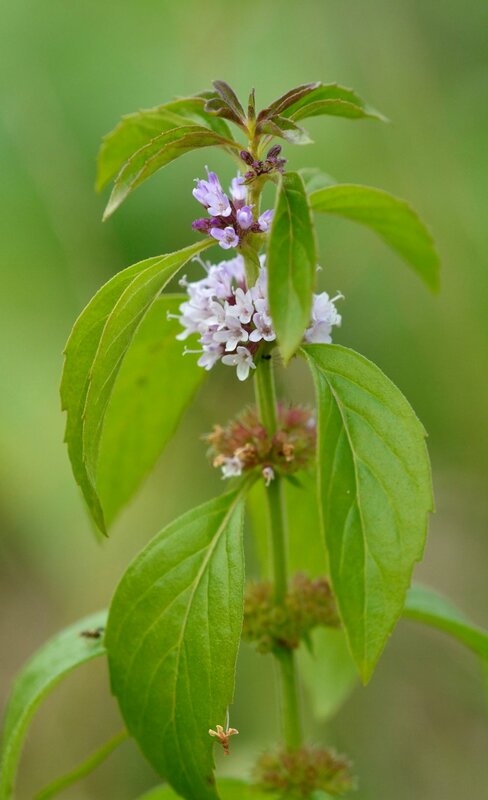 NOTE: If you’re one of those folks who has a severe allergic reaction to insect bites and stings, this herb is not going to replace life-saving medications such as Benadryl and an EpiPen. These little herbs tend to hang out near areas of moisture that have been disturbed. Creek sides, near springs and ponds, or just areas with a good bit of runoff (Biking and hiking paths, roadsides, etc.). Mentha arvensis, Field or Poleo mint. Look for this one near stream sides and wetter areas (probably mingled in with the plantain). For more on how to identify and use mints, check out these articles, Meet the Mints and Medicinal Mints. We’ve all done it. Eaten that questionable appetizer at a friends’ wedding. Engaged in a bit of late night alcoholic revelry and ill-advised snacking. The paths to digestive distress are many and varied, but they all result in a sour stomach and a serious cramp in your style. A simple infused mint tea can be hugely soothing. Acting to cool irritated stomach tissue, as well as improve elimination of the offending food substance, even chewing the fresh mint leaves can bring almost immediate relief in some cases. Here on the Front Range, our wild species is Mentha arvensis (Literally 'mint of the field in Latin). A fairly small mint, but hooboy, does it pack a medicinal punch! Of course, due to a few hundred years of enthusiastic gardening, there is also now a thriving population of escaped cultivated mints, so look out for those as well:). There are so many more herbs for herbal first aid, both here and throughout the US. This is a great time of year to get to know some new plant friends, as well as expand your herbal knowledge. No matter how awesome, this article can in no way replace the care of a medical doctor. It is not meant to treat, diagnose, or prescribe in anyway. The above statements are not approved by the FDA. Take a Class! If you’re in the Boulder area, the Colorado School of Clinical Herbalism is hosting Wilderness Herbal First Aid and First Responder courses this December and February. Click here to check it out! Meet the Green! Follow us on facebook. We are always posting nifty info on plants, medicine, and cool links to videos and other articles.